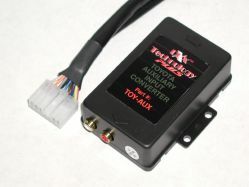 PIE TOY-AUX auxiliary input adapter audio jack for factory Toyota radios, this connect to your factory Toyota Radio and allow you to listen to any external or portable audio source, such as an iPod, Mp3 player or DVD player, Satellite radio through the head unit digital CD-changer input port, this interface is not universal, it's made to work in a Toyota vehicles only, and please don't confuse with FM modulator or FM transmitter. No more sound-degrading FM modulator or clumsy cassette adapter. Get clean, high quality sound playing through your factory Toyota Radio. The PIE Aux-In mimics a CD-changer and "tricks" your radio into playing the auxiliary source. Toyota aux audio input. 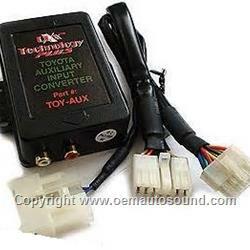 Not compatible with Radio models Camry AD6809 AD6900 or AD6810. 1998-2005 Toyota vehicles with CD-changer control. Listen to an auxiliary source through your existing audio system. No need for sound-degrading FM modulator. Connects to factory 12-pin connection at back of radio.